Is Glorystar available in my region? The following map shows the estimated coverage of the Glorystar system signals in North America. The map's contour lines indicate the footprint and signal strength. 50 being the strongest signal and 38 the weakest. 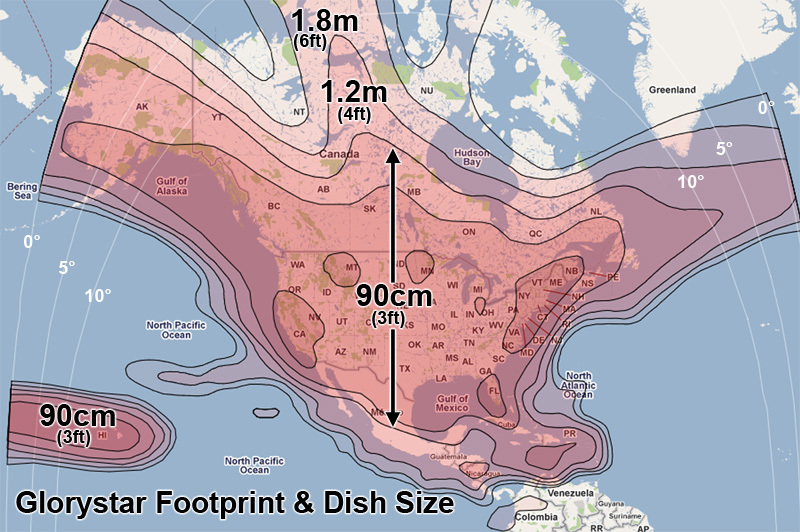 If you live inside the 46 or high contour lines we recommend our standard 36 inch dish. Contour lines lower than 44 may require a larger dish, which is available at an additional charge through Glorystar. Note: This map is based on estimated signal measurements. Please call for if you have any questions regarding the signal availability in your area. At this time we directly ship to US, Canadian and Mexican addresses. Please contact us with your freight forwarder information if you live outside of these countries. I have trees or tall buildings near my property. Will these interfere with reception of Glorystar? Satellite signals will not travel through leaves, branches buildings or overhangs. There must be a direct line of sight to the satellite to receive Glorystar channels. In North America, the satellites are always located to the South. Imagine a point in the sky that is located over the equator in line with Mexico and Texas. If you live in the East, the satellites will be located Southwest of your location, If you are in the West, the satellites are Southeast. In Mexico the satellites are very high in the sky, but in Canada, Alaska and Hawaii, the satellites are very low near the horizon. Glorystar recommends that if you have any questions regarding the availability of the signal in your location that you contact us before ordering a system or contact a local satellite installer to perform a sight survey. Can I receive other channels with this system? Glorystar systems are pre-programmed to receive Christian TV and Radio channels. Glorystar only provides technical support for the reception of our Christian broadcast partner's channels. You may choose to scan and receive additional free secular channels available in English, Arabic, Chinese and Korean and several other languages. For an additional investment in equipment that may require a somewhat complicated setup process, you can purchase a motorized dish that allows you to point at several different satellites. These satellites will provide a total of approximately 300 channels and a wider variety of English programming. Please call for details. Can I install the satellite system myself? If you have a good understanding of how to use a compass, have basic mechanical skills and a technical aptitude you should have the skills necessary to install the system. If you need professional installation, please call Glorystar and we will book a local technician (available in most areas of the US and Canada). Can I use this system with my big C-band dish? We recommend that you purchase a complete Glorystar KU-Band system if you are only wishing to receive the Glorystar channels. Many additional channels can be received with a C-Band dish and LNB; however, if your dish is also KU capable, you may find it hard to fine tune your dish for optimum KU-Band reception of the digital signals. Can I use my existing Dish Network or DirecTV dish? No, a slightly larger dish is required with a different type of LNBF mount. To get programming from Glorystar, you must use a linear polarity LNBF. The Dish Network and DirecTV LNBFs use circular polarity and use a different frequency than free to air services. Why can't I use a Dish Network or DirecTV receiver? DBS receivers are proprietary and targeted at a particular service. These receivers will not work on satellites that use other audio and video encoding parameters. For example, a Dish Network receiver will only receive signals that have the same signal rate and forward error correction as Echostar satellites use. A receiver that can handle variable SR / FEC and receive non encrypted programming is called a Free To Air (or FTA) receiver. We only sell FTA receivers. Can I pay for my system in monthly installments? No, however you may use a credit card, debit card. You may also make payment by check or money order.